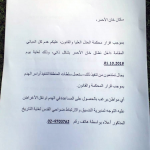 The flyers printed on head paper with the emblem of the Israeli Defense Forces intimates the residents of Khan al Ahmar to destroy their own community. In case, they don’t do it, the occupation forces will do so. The flyer ends with the remark that in case residents want support in the destruction of their own homes and lives or in the transfer, they can contact the phone number given at the end, which corresponds to an office at the so-called ‘civil administration’ of the Israeli occupation forces. “Israel is weighing the backlash of the destruction of the Bedouin community against their will to continue the ethnic cleansing of the Palestinian people, trying new tactics as they go along. “In fact, the orders to Palestinians to destroy their own homes is something the Israeli state issues regularly. When home owners refuse, they are normally forced to pay the costs incurred by the Israeli forces in the destruction of their homes.